The Cleaning and Hygiene Suppliers Association have established a standard that participating manufacturers must comply with in order to gain accreditation. allowed to carry the scheme logo on each box. Strong and absorbent, Centre Pull Rolls provide excellent drying and wiping properties in kitchens, washrooms and many other areas. In White or Blue, 1, 2 & 3 ply and in various widths our range is comprehensive. All multi ply products are edge embossed and perforated. Every Centre Pull has an easily removable core. Wiper Rolls have a multitude of uses. In industrial and engineering premises, garages and workshops they provide an efficient, hygienic and cost effective alternative to rags and other more traditional wiping methods. Manufactured in 1, 2 and 3 ply White and Blue and in several widths, all multi ply Wiper Rolls are edge embossed and perforated. Produced in 2 ply White and Blue and a heavy duty 3 ply Blue, all rolls are perforated and edge embossed. These absorbent wipes have good strength when wet. 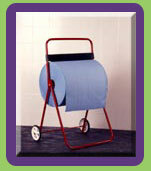 The smaller 10 rolls are ideal for general wiping in kitchens, laboratories, surgeries etc. 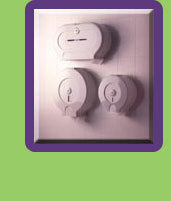 and can be used with or without a dispenser. The larger 20 rolls are most often used for covering medical couches and work or desk surfaces. White rolls are wrapped in clear polythene bags. We manufacture a full range of Mini, Midi & Jumbo Toilet Rolls on 2 1/4 and 3 cores. All Jumbos are produced from high quality recycled paper, perforated and 2 ply products are edge embossed. 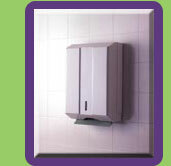 These systems give excellent value and combined with a comprehensive range of dispensers provide the benefit of low maintenance. 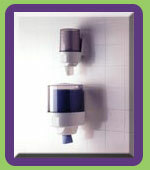 Our toilet tissue range is completed with 1 and 2 ply Bulk Pack and Conventional Toilet Rolls. A most cost effective method of hand drying is by individual heavy weight towels. 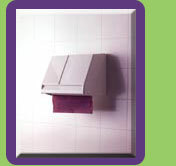 Our range comprises of both C-Fold and Inter Fold Towels. All are produced in heavily embossed Green, Blue and White recycled paper. 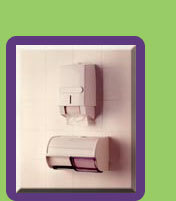 Roll Towels are manufactured from the same heavy paper as our folded towels giving them a tough feel. For the luxury market we supply a soft 2 ply white towel.